Case Keenum finished 20 for 37 for 167 yards in the Minnesota Vikings' loss. 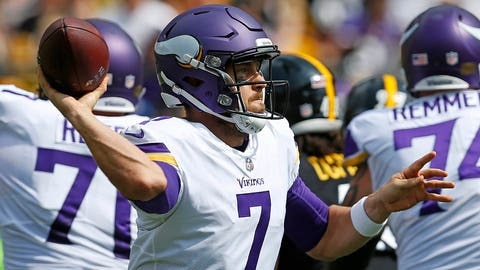 PITTSBURGH — Case Keenum learned he was going to start on the road against a Super Bowl contender a few hours before kickoff. It hardly rattled the Minnesota Vikings backup quarterback. It’s what he signed up for when he joined the Vikings as a backup following two uneven seasons with the Rams. One problem. Keenum’s presence didn’t surprise the Pittsburgh Steelers either. Harried at the start and hurried at the finish, Keenum struggled to find anything resembling momentum in a 26-9 loss that brought Minnesota crashing back to reality following an impressive opening victory over New Orleans. That romp, however, came with Sam Bradford under center. When Bradford’s swollen left knee prevented him from going to work against the Steelers, the Vikings hoped Keenum would provide a spark. It simply didn’t happen as Pittsburgh’s steady pressure and a steady stream of penalties left Minnesota running in place. Vikings coach Mike Zimmer declined to get into specifics about Bradford’s injury or how long Bradford might be out, saying only that Bradford would be “OK.” Minnesota (1-1) hosts Tampa Bay (1-0) next Sunday. “Maybe the next week, maybe six weeks from now,” Zimmer said when asked when Bradford could return. If what happened against the Steelers is an indication of what life without Bradford might look like for the Vikings, Minnesota’s promising start could prove to be a mirage. Keenum finished 20 for 37 for only 167 yards. He was sacked twice, his longest pass a beautiful 27-yard grab by tight end Kyle Rudolph that helped set up Minnesota’s only touchdown, a 1-yard dive by C.J. Ham that briefly pulled the Vikings within 17-9 in the third quarter. Just not nearly hard enough to provide a legitimate threat to the Steelers. Minnesota only managed five first downs in the opening half as the Steelers built an 11-point lead. Pittsburgh kept Vikings rookie running back Dalvin Cook under wraps, his only splash play coming on a 25-yard sprint that ended up just short of the goal line. Cook was held to 39 yards on his other 11 carries, forcing the Vikings to search elsewhere for a spark. Twice Jerick McKinnon took kickoffs deep in the Minnesota end zone and opted to bring it out, failing to reach the Minnesota 20 both times. Zimmer called for an ill-fated fake punt on fourth-and-4 at the Minnesota 36 on the first possession of the second half. Punter Ryan Quigley’s pass was batted down and Pittsburgh’s Chris Boswell kicked a field goal to push Pittsburgh’s advantage to 17-3. Boswell initially missed a 51-yard attempt but received a reprieve when the Vikings were called for illegal formation. Boswell drilled the ensuing 46-yarder. Minnesota finished with 11 penalties for 131 yards, including a pair of pass interference flags that set up Pittsburgh touchdowns. Minnesota’s defense did a solid job otherwise, limiting Pittsburgh to 335 yards and holding Le’Veon Bell to 89 total yards on 30 touches. It just wasn’t enough on an afternoon the offense looked out of sync without Bradford.